When checked, Tabs Studio tabs are not visible, but Tabs Studio toolbar is still available and you can enable Tabs Studio back if needed. Thank You! 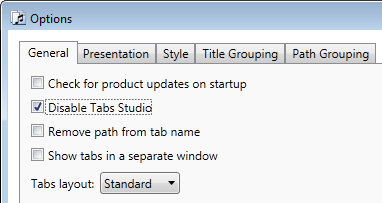 I love Tabs Studio in VS 2010, but not so much in SQL Server Management Studio. This makes it easy to get just what I want!